At the First District, two volunteers staffed the booth. The booth was very well received. They did surveys on police, U.S. Attorneys office staff, staff from the Mayor’s office, probation officers and others. Based on these surveys the most important drug to handle in the area is synthetic drugs. All those surveyed were in agreement that this was a huge problem. 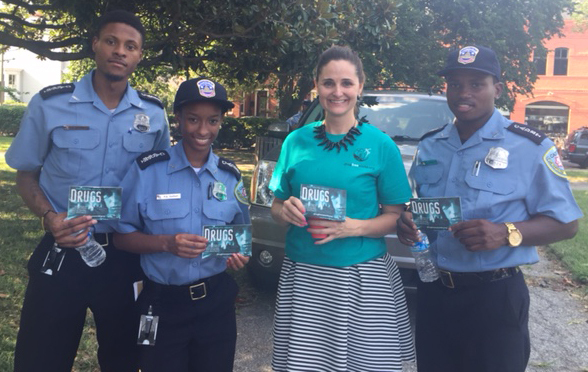 D.C. Police Cadets with DFW Volunteer at First District. The probation officers said that synthetic drugs were the number one drug BY FAR that their clients are using. Police and Fire Department officials said that almost all their drug overdose calls are for synthetics. People also reported that PCP use is growing, generally that is with an older population. Homeless shelters were brought up by almost all the government agencies and terminals that these are being inundated with synthetics and they are having a huge problem with it there. The police photographer came over and took a picture of the table and volunteer Jennifer holding the Truth about drugs brochure. She said it would go into their internal newsletter and promotion internally for who helped the police on their event. The U.S. Attorney’s Office had a table and said that synthetics was the main problem and the person there was given a booklet and she said she already had one on her desk in the office and they are using it a lot! The event this year was held on the grounds of Georgetown University. Volunteers spoke with many community people as well as a variety of professional people interested in drug education. 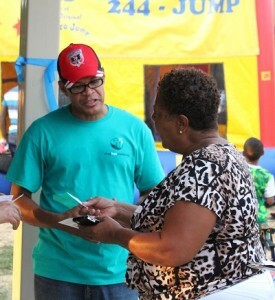 D.C. Chapter volunteer speaking with a woman from community at National Night Out event. They also spoke with Rhonda Hardy, from the D.C. Metropolitan Police Department as well as another police official who spoke about the harm they see from alcohol. Ms. Hardy said it was much more widespread than any of the other drugs in their area. The Police Commander for the Second District Police came by the booth and thanked us for coming. He was familiar with the program. Several students came by, one from China and a couple from Taiwan. They had about the Drug-Free World program in Taiwan and wanted to know more.